When I was a child, I actually was very hyperactive - I would talk to everyone and anyone. When I started grade 3 I was teased a lot and it continued until high school. I always had self-confidence issues and when I started getting teased it just got worse – they were telling me the same things that negative little voice was telling me. Instead of sticking up for myself, I just kept quiet and took in all of the bad things they were saying. I would dread events where I would have to meet new people or mingle with friends because it was just awkward and I would have anxiety leading up to the day. A few years ago I had reached a point in my life where I wanted to stop worrying what others might think. My shyness, like a lot of other shy people, included the fear of meeting new people, lack of self-confidence and self-consciousness. I’m still shy at first but it is easier to join in on the conversation. I'd like to share with you some of the tips and techniques that have helped me overcome my shyness. Overcoming shyness isn't about suddenly thinking you're so great. It's more about forgetting yourself and focusing outward. Shy people can often feel they have 'nothing important to say'. If you are at a party with strangers, try to connect how everyone knows each other. Ask questions and show genuine curiosity. This gives you something to talk about and it gives other people a chance to talk about themselves. I try to have my go-to list of questions to ask in order to start a conversation and start feeling more comfortable in my surroundings. Practice preparing topics of conversation, if you have an idea of the type of people that are going to be at a gathering, then do a little homework. If many of them are golf enthusiasts, for example: Google the local golf club, find out more about the topic and prepare a few questions to ask about it. Get into the habit of remembering what people have told you and referring back to it as future conversation starters. "Hey Josh, last time I remember you were saying you wanted to see that movie? I saw last night and thought it was great!" or "Julia, you were telling me that your daughter loves this band, I heard they are coming to town next week..."
Shy people are often misdiagnosed as unfriendly, aloof, or 'stuck up'. Shyness can make us look unapproachable. Research has found that we find people who smile and look directly at us more attractive and people are more likely to strike up conversations with strangers if they are smiling. If you see someone who also seems a little shy or anxious, approach them to help them feel more relaxed, by focusing on putting other people at their ease, you'll find that you feel much more comfortable. Shyness is really a type of social anxiety. Mentally rehearsing being more outgoing and relaxed has amazing results. Before the outing, lay down somewhere comfortable, focus on breathing deeply and slowly, and imagine watching yourself in the upcoming social situation looking relaxed, comfortable, and even talkative. You'll be amazed how this 'self-hypnotic' preparation will affect the way you actually feel when you get there. Extending the out-breath begins to relax body and mind very quickly. Once you feel more relaxed, you instantly feel more sociable. Start putting yourself in as many social situations as possible. We build fear around what we avoid; so by purposely seeking out situations which would have made you feel shy, you can begin to kick that shyness out of your life. Try to make progress in small steps. You can do one of these tips one at a time or try a few all at once. You won’t become the social butterfly overnight but this will give you something new to learn every time, and you can proudly keep track of your progress. Keep doing things like having conversations with new people and seeking out opportunities to connect with others. Overcoming shyness is a process but it can open up whole new dimensions in your life. Suffering from shyness shouldn't keep you from the success you are seeking. 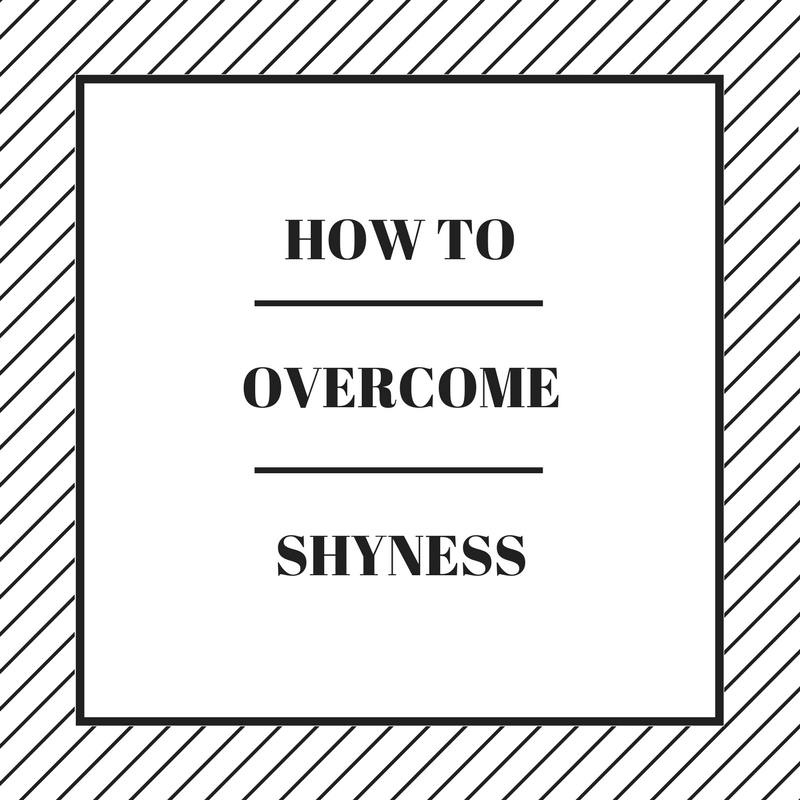 I hope these tips will help you overcome your shyness.